A suburban home. 4:45 pm Friday afternoon. The housewife sits at the dining room table while the children run amok. Her hair is in curlers. Her face lacks makeup. The babysitter is due at any moment. She is frantically pushing fabric through her sewing machine. The doorbell rings. Housewife: Must be the babysitter! Daughter #1: Mom! Some girls are here! Housewife: (aside) Not another fundraiser… (to her daughter) What do they want? Son #2: (eagerly) They’re selling cupcakes. Housewife: (aside) I am not getting up from this machine. (sighing, to son) Tell them they have to come in. Enter the babysitter, a woman in her 20’s. Housewife: Stephanie, what do they want? Girl #1: We’re selling cupcakes. Housewife: Do I have to pay you now? 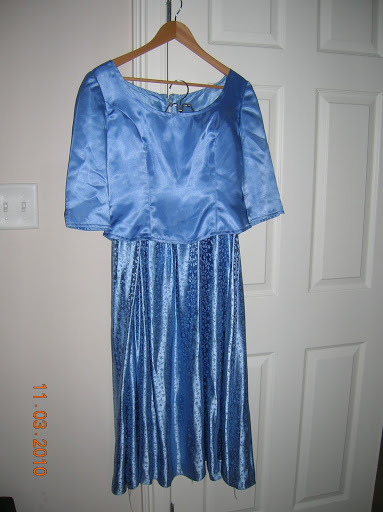 Housewife: (loud sigh, shaking head) Girls, I’m Cinderella, and I’ve got to finish this dress for the ball. Son #2: I’ve got money, Mom! Housewife: You want to buy cupcakes? (He nods his head.) Then go get your money. Girl #1: We’ve got red velvet, vanilla……(The din of running, playing children obliterates the sound of her voice.) What kind would you like? Housewife: You’ll have to ask the buyer. Housewife: That’s your dad! Somebody answer the phone! Son #1 answers phone. Son #2 returns with money. He orders cupcakes. Girls depart. Son #1 hangs up phone. Son #1: Dad’s on his way home. Housewife: (rising triumphantly from her chair and shaking out the dress) Good! And my dress is complete! 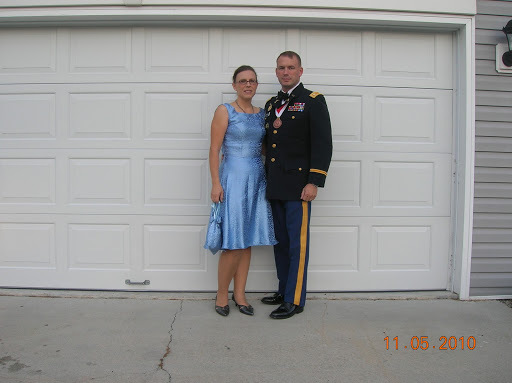 This entry was posted in home life, sewing projects. Bookmark the permalink. Fabulous,dahling, just fabulous. I like your style! Wow! You did a great job. You look great in that dress! That dress is awesome! It really looks like a vintage throw back! wow, showing your shoulders, you wench. It turned out GREAT! 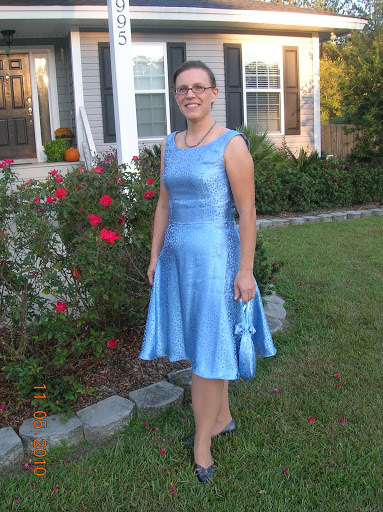 There's a lady who has a blog repurposing dresses, one a day for an entire year. She has some good transformations, but yours is the best! Jennie, how did I know you would notice the missing jacket? Nope, I got 70% done and had to call it quits. I did school on Friday and a dr appt for an earache and tried to go to mass, too, and I just couldn't squeeze it in. I wore a sheer scarf I already owned which was fine at first. But the temps dropped so much after nightfall, that my teeth were literally chattering until the car heated up on the drive home. Excellent work! It's just perfect. So talented!!! You look great!